This Dreamspun Desires story contains a whole lot more glamour, angst, and fluff than M.J. O’Shea’s usual stories, but I have to admit that I thoroughly enjoyed this Harlequin style romance. 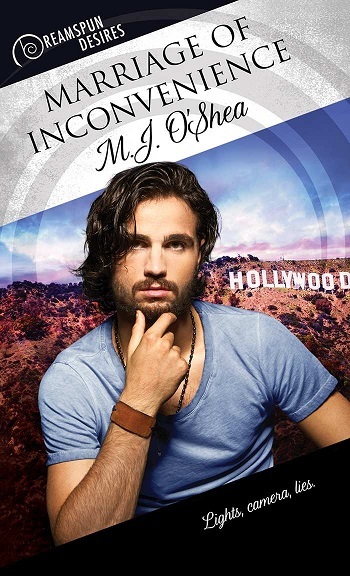 As one of Dreamspinner’s best writers, M.J. O’Shea is able to take very familiar elements of the traditional Harlequin Romance (wealthy celebrity meets distinctly average suitor in contrived circumstances and a forced partnership becomes true love…) and create an engaging and nearly believable story. This might lack the depth and magic of a book like Devil’s Food at Dusk or Open Road, but this is a fun take on a traditional romance plot. The leading man in this story is Jericho, a handsome, wealthy actor in need of a partner to protect his image. Our distinctly average suitor is Kerry, a shy assistant to Jericho’s PR manager. The relationship progression is predictable (but I think that’s the point of the Dreamspun Desires book), but has been given a few 21st century updates. Like the old school Harlequins, this story focuses on the romance between Kerry and Jericho and nearly fades to grey when they reach the bedroom. This is a guilty pleasure, a quick easy read that should be enjoyed and not scrutinised too closely. I love the way some of my favourite authors are playing with the components of the traditional Harlequin in the Dreamspun Desires books, and this has to be one of my favourite stories so far. Reviewers on the Wicked Reads Review Team were provided a free copy of Marriage of Inconvenience by M.J. O'Shea to read and review.